Primary Care Trusts are a flagship initiative of government policy for modernising the NHS. The new requirement for frontline healthcare professionals to work together stretches across both community care and public health, and as a result traditional boundaries are being blurred and new local roles and resources are emerging right across the primary care sector. This book draws practical lessons for Primary Care Trusts from applied research and development programmes in other parts of the NHS, other parts of the public sector, parallel developments in the private sector and relevant international experience. With contributions from the Health Management Group and its associates, this book provides a comprehensive approach and practical guidance. It includes new specific models for local development on clinical governance, evidence-based medicine, use of applied health services research, social services collaboration, new organisational partnerships, public health alliances, community hospital usage and managed care. 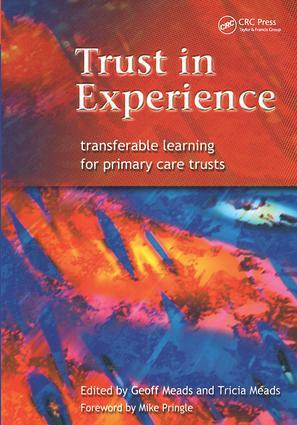 Trust in Experience will enable readers to create PCTs as their own organisations and not simply as local agents of central policy, and perceive changes as positive opportunities whilst recognising the risks involved. Section One: Policy into Practice. Transferable learning. Traumas and turning points. Rhetoric, resources and realities. Section Two: Practice into policy. Releasing the relationship dividends of 'new' partnerships. Owning up to the public health agenda. Getting to grips with Social Services. Turning community hospitals into assets. Balancing bigger budgets. Developing the organization. Making friends with clinical governance. Making decisions with clinical effectiveness evidence. Practising both care management and managed care. Realising research can be relevant. Section Three: Looking ahead. Regaining public confidence. Taken on trust. Appendices.